Raspberries are one of summer’s great delights and one of my favorite fruits. I always look forward to berry season. It means bowls of sweet, juicy, fresh raspberries. If you have never considered adding them to smoothies then please do so. With a milder flavor than say blueberries, and a bit more sharpness than strawberries, they complement almost any other fruit. 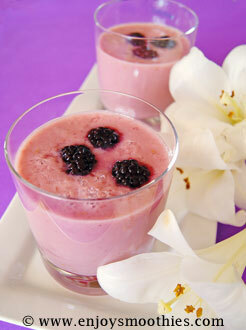 They will add a sweet tang to any raspberry smoothie, without the need for any further sweetening. And because they are high in fiber and low in sugar, they are great for weight loss. Raspberries offer an abundance of health benefits. They are rich in vitamin C, (one cup will give you half of your daily recommended allowance), and also contain vitamin A and vitamin E.. High in fiber and low in sugar, they are great for helping with weight loss. Raspberries have one of the most diverse range of phytonutrients of almost any other fruit, from anthocyanins, flavonols, tannins and ellagic acid. These phytonutrients not only have antioxidant and anti-inflammatory benefits, but are in significant enough quantities to protect us against oxidative stress and the dangers of excessive inflammation. Raspberries are plentiful from June until October in the northern hemisphere and from December to April in the southern hemisphere. When buying look for fruit with a deep red color. Select berries that are firm and plump, but avoid anything which is soft, mushy or moldy. If you are buying berries that are pre-packed make sure they are not packed too tightly, otherwise they will crush and become damaged. Raspberries are highly perishable and once purchased should be used within one or two days, otherwise, they will need to be frozen. To prepare for freezing, wash gently and pat with a paper towel. Arrange the berries in a single layer on a flat tray and place in the freezer. Once frozen, transfer to a plastic freezer bag. These little berries are very fragile, so great care should be taken while storing them. .Once purchased remove any berries that are moldy or spoiled, otherwise they will spoil the rest. The remaining ones can be stored in their original container or transferred to a wide bowl or plate. Then cover with plastic wrap. They will keep unwashed in your refrigerator for one or two days only. 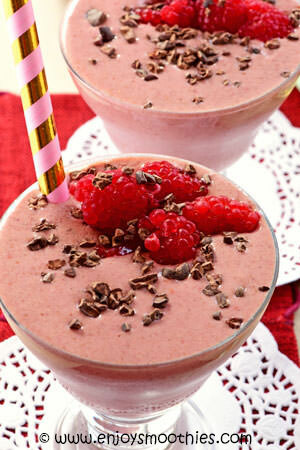 Raspberries can be added to smoothies either fresh or frozen. But because of their short shelf life, frozen berries might be more practicable. Remember, if you wouldn’t eat them, don’t throw them into your blender. 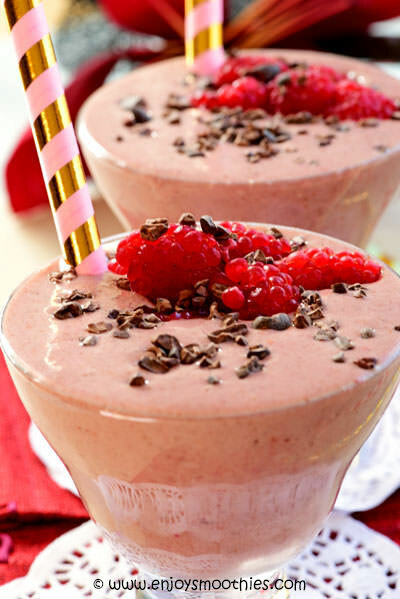 Combine the banana, raspberries, almond milk, Greek yogurt, cacao, almond butter, flaxseeds and vanilla extract and blender until thick and creamy. Pour into two large glasses and serve. 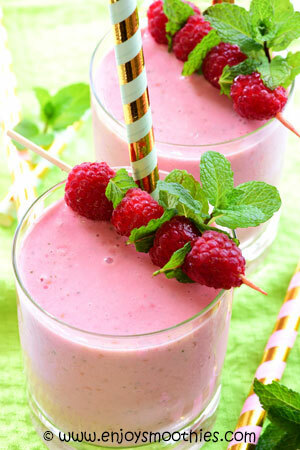 Blend together the banana, raspberries, almond milk, vanilla yogurt and fresh mint until smooth and velvety. Pour into two glasses and decorate with fresh raspberries. Enjoy. Roughly chop the cantaloupe into chunks. Exact measurements are not necessary here. Use more or less according to taste. 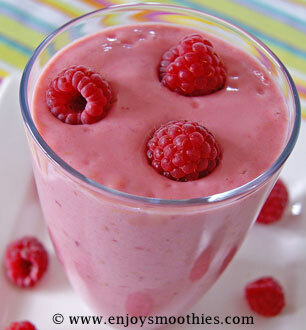 Place the raspberries, cantaloupe, banana and milk into a blender and process until smooth. Place all ingredients in a blender and blend for 1 minute or until smooth. Pour into a glass and enjoy. You can use fresh or frozen cherries for this recipe, but if using fresh cherries you will need to remove the pits first. 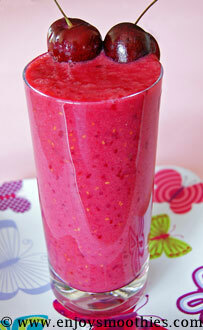 Place cherries, raspberries, banana and apple juice into a blender and process for 1 minute or until smooth. Add ice if you prefer a thicker smoothie.